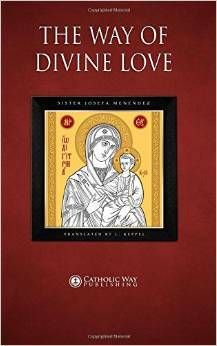 The following material is quoted verbatim from the book “Way of Divine Love” of Sister Josefa Menendez (1890-1923). 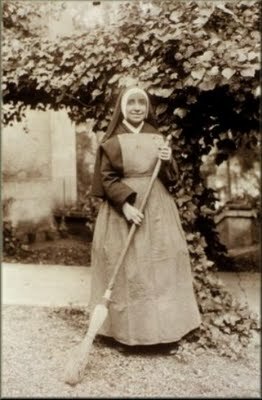 Sister Josefa was a Spanish nun of the Society of the Sacred Heart and lived only four years as a religious, at the convent of Les Feuillants in Poitiers, France, where she died at the age of 33. “The Way of Divine Love” consists largely of her notebooks, that she wrote down under obedience from our Lord, with the revelations of his Sacred Heart, plus portions of her biography. This material was composed after Rev. Schouppe wrote his book on Hell. This young Spanish sister, who had a short religious life of great suffering, experienced revelations throughout much of her life, compiled in The Way Of Divine Love. More than once, she was taken to Hell to witness and feel the suffering first-hand. Sister Josefa was reluctant to write on the subject of Hell, and did so only to conform to Our Lord’s wishes. Sister Josefa repeatedly dwelt on what she described as the greatest torment of Hell, namely, the soul’s inability to love. One of these damned souls cried out: “This is my torture…that I want to love and cannot; there is nothing left me but hatred and despair. If one of us could so much as make a single act of love…But we cannot, we live on hatred and malevolence…” (March 23, 1922). She records, too, the accusations made against themselves by these unhappy souls: “Some yell because of the martyrdom of their hands. Perhaps they were thieves, for they say: ‘Where is our loot now?’ …Cursed hands… Others curse their tongues, their eyes…whatever was the occasion of sin… ‘Now, O body, you are paying the price of the delights you granted yourself!…and you did it of your own free will…'” (April 2, 1922). “I saw several souls fall into Hell, and among them was a child of fifteen, cursing her parents for not having taught her to fear God nor that there was a Hell. Her life had been a short one, she said, but full of sin, for she had given in to all that her body and passions demanded in the way of satisfaction…” (March 22, 1923). “My soul fell into abysmal depths, the bottom of which cannot be seen, for it is immense. . . ; Then I was pushed into one of those fiery cavities and pressed, as it were, between burning planks, and sharp nails and red-hot irons seemed to be piercing my flesh. I felt as if they were endeavoring to pull out my tongue, but could not. This torture reduced me to such agony that my very eyes seemed to be starting out of their sockets. I think this was because of the fire which burns, burns. . . not a finger nail escapes terrifying torments, and all the time one cannot move even a finger to gain some relief, not change posture, for the body seems flattened out and [yet] doubled in two. Sounds of confusion and blasphemy cease not for an instant. A sickening stench asphyxiates and corrupts everything, it is like the burning of putrefied flesh, mingled with tar and sulfur. . . a mixture to which nothing on earth can be compared. . . although these tortures were terrific, they would be bearable if the soul were at peace. But it suffers indescribably. . . All I have written,” she concluded, “is but a shadow of what the soul suffers, for no words can express such dire torment.” (September 4, 1922). “Others curse their tongues, their eyes… whatever was the occasion of their sin… ‘Now, O body, you are paying the price of the delights you granted yourself!.. and you did it of your own free will… ‘” (April 2, 1922). (That is, illegitimate delights). “It seemed to me that the majority accused themselves of sins of impurity, of stealing, of unjust trading; and that most of the damned are in Hell for these sins.” (April 6, 1922). “Some accused people, others circumstances, and all execrated the occasions of their damnation.” (September 1922). “I heard a demon, from whom a soul had escaped, forced to confess his powerlessness. ‘Confound it all… how do so many manage to escape me? They were mine’ (and he rattled off their sins)… ‘I work hard enough, yet they slip through my fingers… Someone must be suffering and repairing for them. '” (January 15, 1923). (“Repairing,” that is, “making reparation” for them). “The devil answered: ‘Insinuate yourselves by inducing carelessness in them. . . but keep in the background, so that you are not found out. . . by degrees they will become callous, and you will be able to incline them to evil. Tempt these others to ambition, to self-interest, to acquiring wealth without working, whether it be lawful or not. Excite some to sensuality and love of pleasure. Let vice blind them. . . As to the remainder. . . get in through the heart . . . you know the inclinations of their hearts. . . make them love. . . love passionately. . . work thoroughly. .. take no rest . . . have no pity. Let them cram themselves with food! It will make it all the easier for us. . . Let them get on with their banqueting. Love of pleasure is the door through which you will reach them . . .’ ” (February 3, 1923). “Tonight,” wrote Josefa, “I did not go down into Hell, but was transported to a place where all was obscure, but in the center was a red smoldering fire. They had laid me flat and so bound me that I could not make the slightest movement. Around me were seven or eight people; their black bodies were unclothed, and I could see them only by the reflections of the fire. They were seated and were talking together. “He added such horrible things that they can neither be written nor said. Then, as if engulfed in a whirl of smoke, they vanished.” (February 3, 1923). “Then Hell re-echoed with frenzied cries, and when finally the devil cast me out of the abyss, he went on threatening me. Among other things he said: ‘Is it possible that such weaklings have more power than I, who am mighty… I must conceal my presence, work in the dark; any corner will do from which to tempt them… close to an ear.. in the leaves of a book… under a bed… some pay no attention to me, but I shall talk and talk… and by dint of suggestion, something will remain.. Yes, I must hide in unsuspected places. '” (February 7, 8, 1923). Again, she wrote: “Souls were cursing the vocation they had received, but not followed… the vocation they had lost, because they were unwilling to live a hidden and mortified life…” (March 18, 1922. “I saw, too, some prelates. One accused himself of having used the goods belonging to the Church illicitly…” (September 28, 1922). “Priests were calling down maledictions on their tongues which had consecrated, on their fingers that had held Our Lord’s Sacred Body, on the absolution they had given while they were losing their own souls, and on the occasion through which they had fallen into Hell.” (April 6, 1922). Josefa noted that the greater number of religious plunged into hell-fire were there for abominable sins against chastity… and for sins against the vow of poverty… for the unauthorized use of the goods of the community… for passions against charity (jealousy, antipathies, hatred, etc. ), for tepidity and relaxation; also for comforts they had allowed themselves and which had led to graver sins… for bad confessions through human respect and want of sincerity and courage, etc. Here, finally, is the full text of Josefa’s notes on “the hell of consecrated souls.” (Biography: Ch. VII–September 4, 1922). “The meditation of the day was on the Particular Judgment of religious souls. I could not free my mind of the thought of it, in spite of the oppression which I felt. Suddenly, I felt myself bound and overwhelmed by a crushing weight, so that in an instant I saw more clearly than ever before how stupendous is the sanctity of God and His detestation of sin. As in her former descents into Hell, Josefa never accused herself of any specific sin that might have led to such a calamity. Our Lord meant her only to feel what the consequences would have been, if she had merited such a punishment. She wrote: “Instantly I found myself in Hell, but not dragged there as before. The soul precipitates itself there, as if to hide from God in order to be free to hate and curse Him. “All this I felt as before, and although those tortures were terrific, they would be bearable if the soul were at peace. But it suffers indescribably. Until now, when I went down into Hell, I thought that I had been damned for abandoning religious life. But this time it was different. I bore a special mark, a sign that I was a religious, a soul who had known and loved God, and there were others who bore the same sign. I cannot say how I recognized it, perhaps because of the specially insulting manner in which the evil spirits and other damned souls treated them. There were many priests there, too. This particular suffering I am unable to explain. It was quite different from what I had experienced at other times, for if the souls of those who lived in the world suffer terribly, infinitely worse are the torments of religious. Unceasingly the three words, Poverty, Chastity and Obedience, are imprinted on the soul with poignant remorse. “Poverty: You were free and you promised! Why, then, did you seek that comfort? Why hold on to that object which did not belong to you? Why did you give that pleasure to your body? Why allow yourself to dispose of the property of the Community? Did you not know that you no longer had the right to possess anything whatsoever, that you had freely renounced the use of those things?… Why did you murmur when anything was wanting to you, or when you fancied yourself less well treated than others? Why? “Chastity: You yourself vowed it freely and with full knowledge of its implications… you bound yourself.. you willed it… and how have you observed it? That being so, why did you not remain where it would have been lawful for you to grant yourself pleasures and enjoyment? “And the tortured soul responds: ‘Yes, I vowed it; I was free… I could have not taken the vow, but I took it and I was free…’ What words can express the martyrdom of such remorse,” wrote Josefa, “and all the time the jibes and insults of other damned souls continue. “Obedience: Did you not fully engage yourself to obey your Rule and your Superiors? Why, then, did you pass judgment on the orders that were given you? Why did you disobey the Rule? Why did you dispense yourself from common life? Remember how sweet was the Rule… and you would not keep it… and now,” vociferate satanic voices, “you will have to obey us not for a day or a year, or a century, but forever and ever; for all eternity… It is your own doing… you were free. “The soul constantly recalls how she had chosen her God for her Spouse, and that once she loved Him above all things… that for Him she had renounced the most legitimate pleasures and all she held dearest on earth, that in the beginning of her religious life she had felt all the purity, sweetness and strength of this divine love, and that for an inordinate passion… now she must eternally hate the God who had chosen her to love Him. “This forced hatred is a thirst that consumes her… no past joys can afford her the slightest relief. “All I have written,” she concluded, “is but a shadow of what the soul suffers, for no words can express such dire torments.” (September 4, 1922). 4-21-19 Easter Sunday They have taken the Lord from the tomb, and we don’t know where they put him. 4-14-19 Palm Sunday Blessed is the king who comes in the name of the Lord. 4-7-19 5th Sunday Lent Let the one among you who is without sin be the first to throw a stone at her. 3-31-19 4th Sunday Lent This man welcomes sinners and eats with them. 3-24-19 3rd Sunday Lent If you do not repent, you will all perish as they did. 3-17-19 2nd Sunday Lent This is my chosen Son; listen to him. 3-10-19 First Sunday Lent If you are the Son of God, command this stone to become bread. 3-3-19 7th Sunday OT: Why do you notice the splinter in your brother’s eye, but do not perceive the wooden beam in your own? 2-24-19 7th Sunday OT: Love your enemies, do good to those who hate you, bless those who curse you, pray for those who mistreat you. 2-17-19 6th Sunday OT: Blessed are you who are poor, for the kingdom of God is yours. 2-10-19: 5th Sunday OT: Depart from me, Lord, for I am a sinful man. 2-3-19: 4th Sunday OT: Today this Scripture passage is fulfilled in your hearing. 1-27-19: 3rd Sunday OT: The Spirit of the Lord is upon me, because he has anointed me to bring glad tidings to the poor. 1-20-19: 2nd Sunday OT: Woman, how does your concern affect me? My hour has not yet come. 1-13-19: Baptism of the Lord: I am baptizing you with water, but one mightier than I is coming. 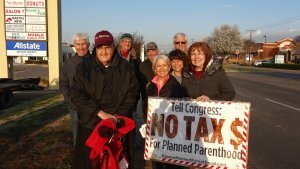 Catholic Prayer Warriors at local Planned Parenthood clinic. 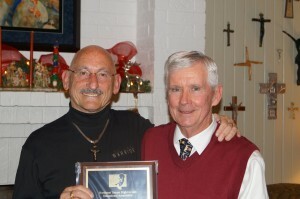 Ralph Zuranski accepts 2015 Defender of Life Award. 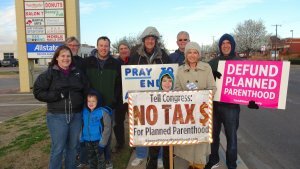 Faithful Prayer Warriors pray at Planned Parenthood three times a week.